When we were young, my mother took my sister and I to a tour in some of the tourist spots here in the Philippines. 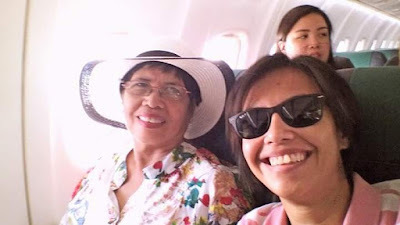 She even would multi-task as mother and office worker when she took us to her out-of-town business trips. I could not really say those instances awakened in me the love for traveling, however it sparked a desire in me and in my sister to give back to her by bringing her also to places she had never been. 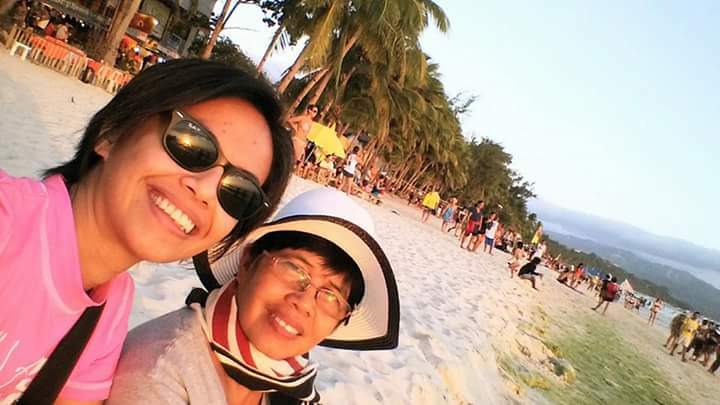 Now in her senior years, my mother had visited a few countries other than the Philippines, and she also visited new tourist destinations in our country, as well. 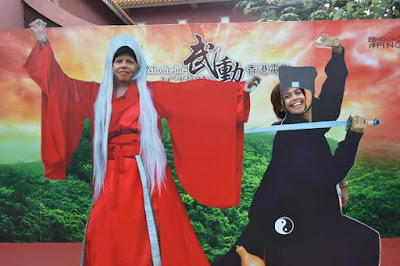 During our trips with her, I have realized that traveling with a senior citizen is something out of the ordinary - an adventure on its own, aside from the destination itself. Striking a pose at the Ngong Ping 360 Cable Car and Village in Hongkong. Unlike us young adults and millenials, senior citizens may not be as agile as before and mood swings might also be a challenge for some. That thought was a light bulb moment for me and so I decided to come up with this article. 1. Comfort should be king. This should be first and foremost in travelling with our folks. Comfort should be on top of the list when planning for trips, from accomodation to travel time, and mode of transportation to take. In the planning process, they should be asked whether it would be comfortable for them to take a 4 to 5-hour bus ride to a certain destination, like travelling from Puerto Princesa in Palawan to El Nido for instance, or would it be fine with them when going to a certain destination entails transfers from plane to bus to boat, such as in Boracay. 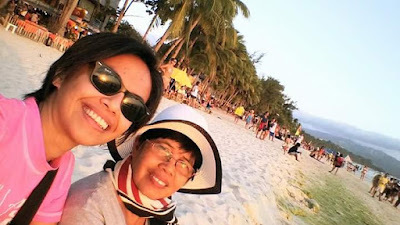 This reminds me of my latest trip to Boracay with my mother. It was ages since I last went to that paradise and while I was on the plane, I was trying to recount where to go next and what ride to take once we land on Caticlan Airport. Good thing the flight attendants were selling these tickets for bus and boat transfers to the island. I admit it was quite pricey (Php 800.00 for a ticket per way per person), but I could not be more thankful and relieved that I bought tickets for us. Travelling was a breeze and we did not need to line up. The guide just told us where to go next and which van to hop into. I could line up for hours to save some bucks but I could not allow my mother to stand for long hours because she has problems with her knees on prolonged standing and in walking long distances. Comfort could come at an exorbitant price but that is nothing if that comfort is for our folks, right? Obligatory inflight photo with Mama taken when we were on our way to Boracay. 2. Safety is a close second. Once you enter your hotel room, take time to survey the place and warn your folks whether, for instance, they need to watch their steps in getting inside the comfort room, or whether they need to keep their head low when passing through the door that leads to the balcony. Safety considerations may also include avoiding places that may have issues with insurgencies or security, and the like. You might want to schedule your travel to those places some other time. Nobody would want to be caught in a crossfire, you know. 3. Make use of privileges of senior citizens. These privileges include being prioritized to board first on the plane, or having seats specially designated for them, or being allowed to skip a que, or simply having the comfort of being transported on a wheelchair by airport personnel. 4. Make sure to pack and bring their maintenance medications, blood pressure apparatus, and glucometers. Going on a vacation does not mean that they also have to take a break from taking their medications and from monitoring their blood pressure and blood sugar levels. 5. As much as possible, meals should be on time. Always bear in mind that our folks do not have iron stomachs like ours which could endure ultra-delayed meals. Sometimes some folks might be too shy to say that they are hungry so sometimes the best indicator is they become quiet, or worse, they become grumpy. Spare yourself from their "wrath," and avoid reaching that point where the signs are flashing in neon lights right in front of your face. 6. Simply lounging at the beachfront is happiness. For these bunch who are in the prime time of their lives, travel may not necessarily equate to adrenaline-pumping experiences. They are quite past that. Join them as they simply enjoy watching the sunset, or watching the waves as they kiss the beach over and over again. 7. They might not be able to do a lot of walking. Most trips usually entail walking. Ask your folks in a nice way if they want to bring along a portable wheelchair. I say that with emphasis on nicely because they might be in denial that they are not as agile as before and you might strike a sensitive chord when you ask them that. An alternative would be to buy them those pricey slippers called FitFlops or Crocs. My mother's rheumatologist actually advised her to have those for her osteoarthritic knees. 8.Ask them what places they want to visit. Lastly, ask them what places they want to visit. In that way, you will be making their dreams come true, all expense paid by you of course. Now you might want to start working and saving for that like, right now (?) 😀 Good luck! Going wacky with Mama at the Upside Down House in Phuket.